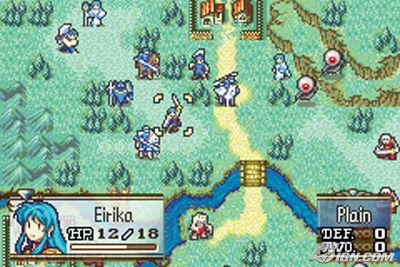 Fire emblem is unlike other nintendo games cause it has a more final fantasy battle style an look to it. You start the game as Seth and Erika but meet alot more people some who are ally's and some who are enemies. The fighting system is alot like final fantasy witch i said earlier. You move on a map a certain number of spaces then you end your turn. Then it's the enemies turn to move if they get right in front of you any direction they attack you but you get a turn to hit them as well. You can also move in front of them and attack them. The weapons have a certain number of hits before they break so go to one of the many shops to buy a new weapons. There is 3 ways to win depending on what you have to do. occasionally- Survive a certain amount of turns. This game has a great storyline and alot of variation in characters. The game does have some problems like there is a little much on the talking and when one of your characters dies there gone for good. For a game made 9 years ago it's still worth playing.